The fate of furious starting Dwayne the Johnson Jason’s Statham Vin Diesel Tyrese Gibison Kurt Russell Scott Eastwood . Family with Dom and Letty on their honeymoon, and Brian and Mia having retired from the game, life is just turning normal for Dom and his globetrotting team. However, they are about to face their biggest trials when a mysterious woman seduces Dom into the world of crime, making him betray those close​ to famliy . 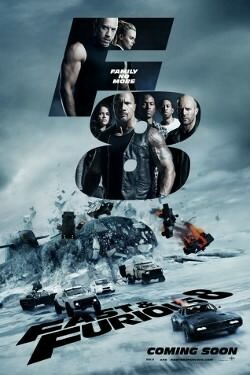 This totally awesome movie in theaters the fighting scene insane action very up pare all fast furious movies enjoy watching this movie very fun to watch . Couple things stand out for me in this movie Dwayne The Rock” Johnson’s back and forth with Jason Statham, but the one that nobody is talking about is Helen Mirren as Magdalene Shaw, the mother of Deckard and Owen. Kurt Russell reprises his role as Mr. Nobody, and he’s dragging along Scott Eastwood as NOT-Brian O’Connor (listed as “Little Nobody” on IMDb). I was actually surprised how well he fit in with the rest of the cast, even if his character was nothing more than a placeholder. Spoiler alert Don found he have baby boy who schiple Charlize Theron character black mail Dom work for her couple national security jobs . This was awesome movie to watch are planning two movies of this movie franshine. This movie reviews Fate furious starting Dwayne the Rock Johnson Jason’s Statham Vin Diesel Tyrese Gibison Kurt Russell Scott Eastwood. This entry was posted in ACTION, ACTION/DRAMA by Movie talk news with Antonio Gutierrez. Bookmark the permalink.